If croissants are what you crave, Supermoon Bakehouse on the Lower East Side may have the answer. This modern bake shop specializes in over-the-top croissants, like the Supermoon Chocolate Croissant, a cacao laminated bi-color croissant filled with a chocolate patisserie cream and topped with peaks of toasted meringue and chocolate shards. It's absolutely fabulous. Other combinations include Raspberry & Champagne, Banana & Toffee, and Strawberry with White Chocolate Chantilly Cream. 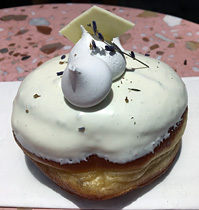 Several doughnuts are offered, including Lavendar & Honey, along with savory croissants and Australian-style sausage rolls. Eat in or take out.